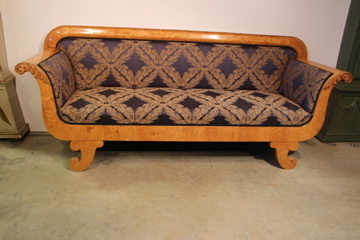 A very rare Italian neoclassical two seater sofa. The elegant arched back with carved and watergilt acanthus scrolls . 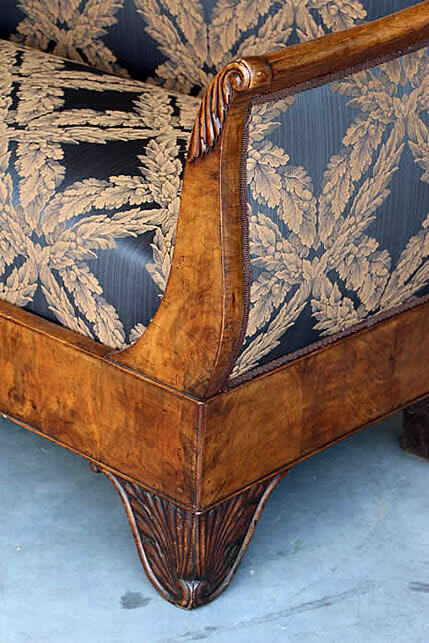 Two gently curving armrests with carved and gilt acanthus leaves lead down to the shaped front double seat raised on six traditional turned and fluted Louis XVI legs. 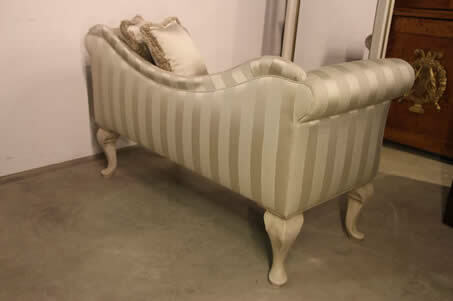 Good original gilding and burnished gesso finish and upholstered seat and back in Regency silk stripe fabric. Italian late 18th early 19th century. 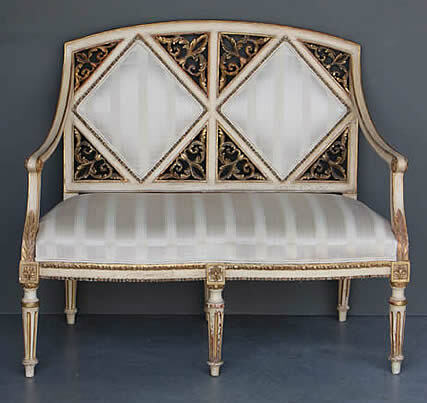 Antique French Louis XVI style vintage tub bergere settee sofa carved giltwood ornate frame and art nouveau velvet upholstery. 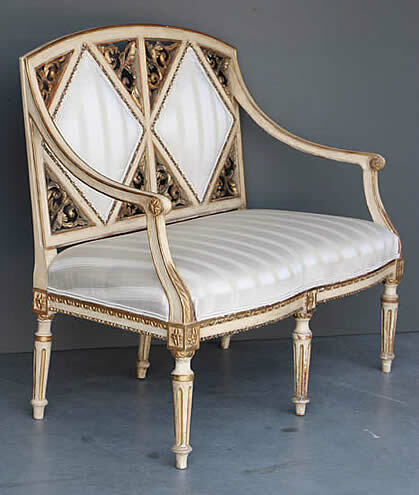 The ornate gold leaf covered wingback design with scrolling bergere armrests and raised on turned fluted legs. This antique furniture sofa design is made for comfort with a sumptuous curved back that supports and surrounds you in luxury...great for your back too! The seat is well upholstered with comfort as parramount with hand stitched springs for support. Note the shaped front to the seat upholstery! Good original gold leaf finish all over. 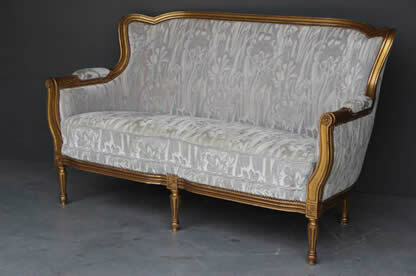 French Louis XVI 18th century manner and of 1930's era. Title Antique Empire 3 piece lounge suite Swedish Karl Johan Empire style with gilt ormolu mounts silk stripe! 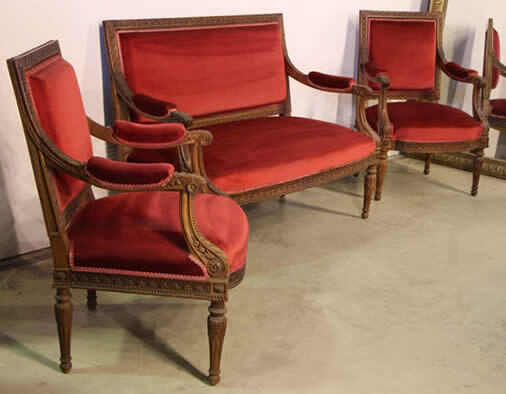 Very well made Empire revival period Swedish 3 piece lounge suite consisting of two matching tub bergere armchairs and a matching tub sofa settee. The superbly french polished and sturdy mahogany frames carved and mounted with mercurial gilt ormolu bronze mounts and raised on gilt bronze lion paw feet. 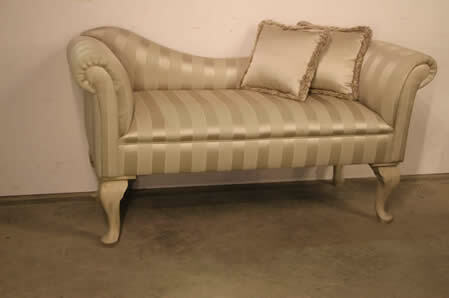 The newly restored gorgeous silk striped upholstery with subtle olive satin stripes. Upholstered right round so this gorgeous suite can stand with pride in the centre of a room and be viewed from all angles. All seats are fully reupholstered with hand stitched edges in the traditional manner but with coil springs for extra comfort . 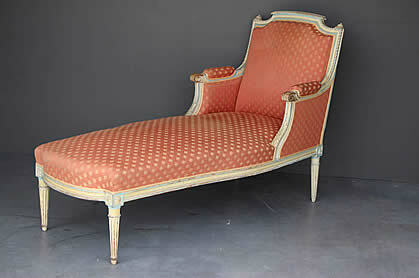 Antique French Louis XVI chaise longue bergere armchair well carved provincial painted finish. 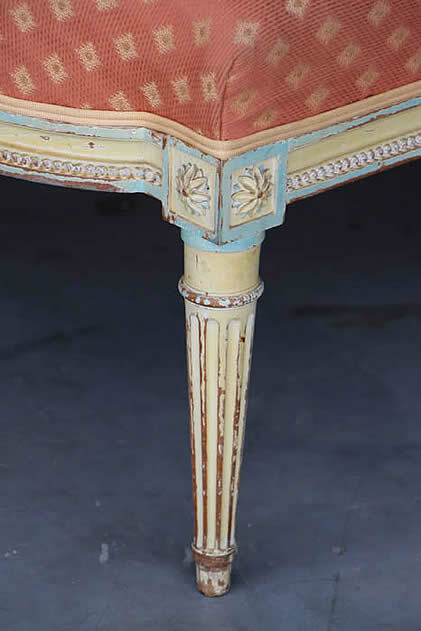 The finely carved solid beechwood frame with painted poder blue highlights to the french white floral carved details. The frames with original painted patina and finish . Covered in vintage upholstery probably from the '90's . The large comfortable seat with springs and good height of 43cm, so luxurious. The more recent upholstery is well done and the sub upholstery all hand stitched edges and coil springs are all in very good condition. you might choose to just change a new top fabric if desired to suit your own interior. 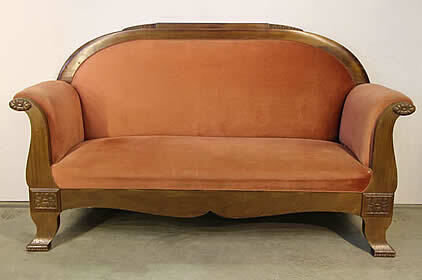 Its a perfect piece of furniture to relax in and stretch out with a coupe of champagne. 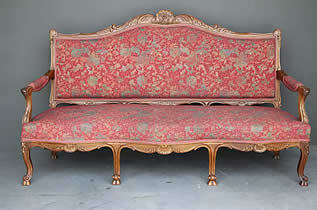 Impressive antique early 19th century French Empire sofa or settee . From the French Empire period 1820, this canape sofa is in well carved ornate solid cherrywood and has been fully reupholstered for comfort and covered in Napoleonic charcoal and gilt wreath fabric. Upholstered in matching pattern silk moire to sides and back so it can stand in the middle of a room with pride. The gorgeous seat made very comfortable with the inclusion of springs and raised to modern height of 53cm at centre of spring seat. The beautiful wood with original warm patina features carved bas reliefs with acanthus scrolls etc. French early 19th century . 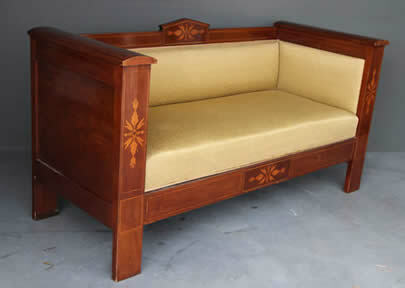 Danish Biedermeier or Empire influence settee in mahogany with ornate marquetry fruitwood inlays. All upholstered with springs seat for extra comfort and may easily be removed for recovering and easy transport. Raised on four pilaster legs this sofa also has ornate marquetry inlays to the front seat rail and solid armrests further adding to a sophisticated Scandinavian lightness to the solid sofa design. 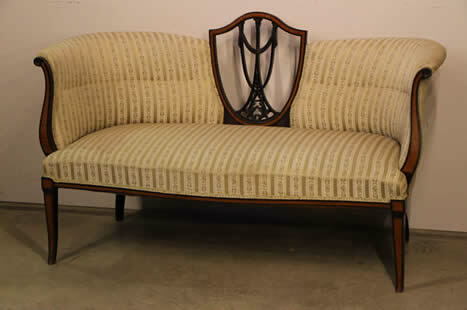 A classic Swedish Biedermeier sofa or settee in solid satin birch with elegant curving armrests and shaped sabre legs. The back is elegantly shaped and supports very nicely. Seat is sprung upholstered and covered in self striping satin black fabric. 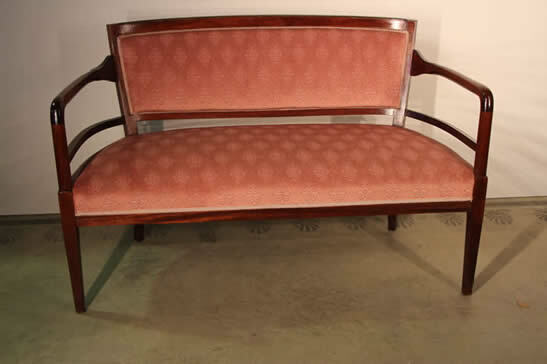 North german Empire influence Biedermeier settee in mahogany with elegant curved back and twin bolster supports. The turned mahogany frontsraised on rectangular supports and with pull out front as a full length bed drawer all superbly veneered in flame mahogany. 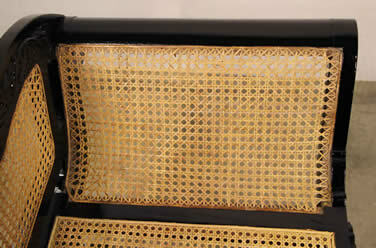 The upholstery fabric appears to be the original woven horsehair fabric and is stretched over sprung base seat. a Beautiful well carved Louis XVI 3 piece longe suite attributed to the master cabinet maker to the Royal court of France King Louis XVI. 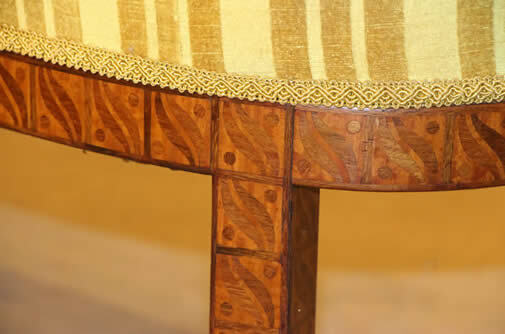 This suite was made of solid walnut and carved profusely with great skill. Recently completely re-upholstered and resprung, for modern comfort replacing the soft down cushions, the sturdy frames are good and solid. 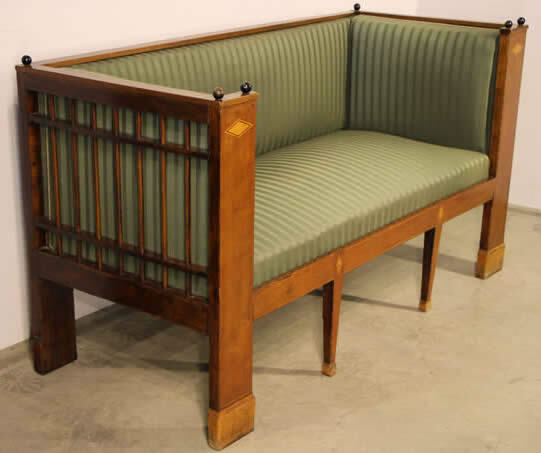 A beautifully shaped elegant Biedermeier settee of the 19th century from a design by noted Prussian architect Karl Friedrich Schinkel . This giltwood settee has been is illustrated in Himmelherber's book "Biedermeiermoebel" Verlag C Beck, 1991 illustration 278: . 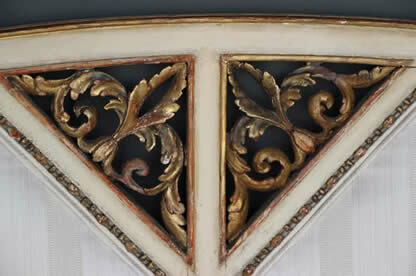 Its generous scroll arms are Well proportioned with ornate carved acanthus scro;;s and arched centre. Seat height is 50 cm and a luxurious depth of 57 cm for extra comfort. 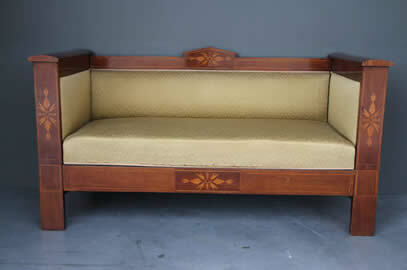 An impressive antique pre Art Deco Biedermeier lounge settee. The arched back with lovely shoulder carvings in the back rail joins elegant swan neck scrolling armrests. 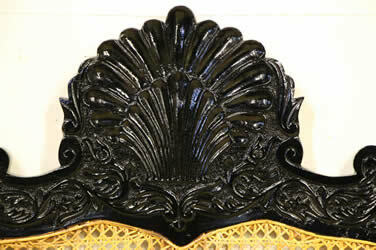 The feature carved mahogany frame with ornate floral carvings where you would expect the usual gold gilt ormolu mounts. This is such refined elegance without pretention and the curved seat rail supports a sturdy spring upholstered seat and back. Fully upholstered around 10 years ago in pale peach velvet , these types of sofas were always designed to stand up against a wall hence the back is high enough to assist head resting. The whole supported by elegant scroll legs with subtle carved toes. Most likely Austrian early 20th century. A matching pair of tub armchairs is in a separate listing. Perfect for an Art Deco apartment. 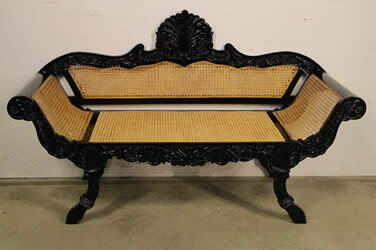 An 19th century Regency manner well carved ebonised sofa of ANGLO-INDIAN origin. Of Regency inspired design this mid 19th century Ceylonese sofa has caned back, sides and seat with hand woven rattan give elegance and lightness to this design. 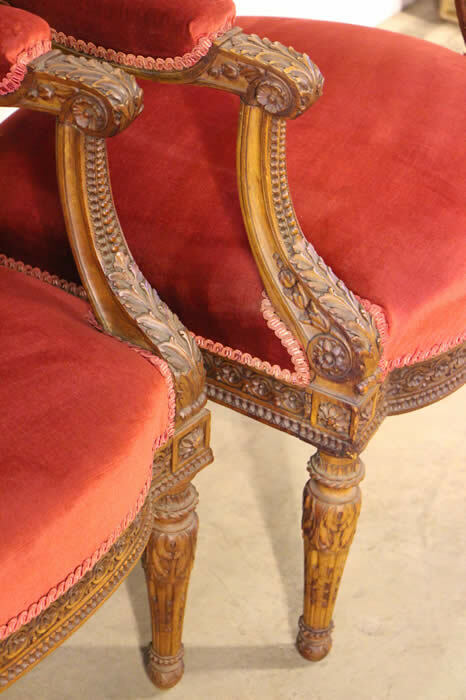 Profusely carved armrests, legs and back feature trailing vines and acanthus. The featured rocaille centre with double scallop shell motif . The elegant scroll arms in well polished piano black finish. 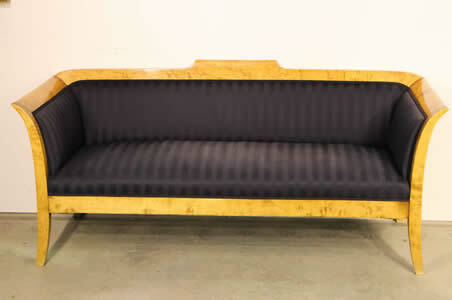 Sofas like these are rarely offered and the most sought after are in solid and brittle black ebony. 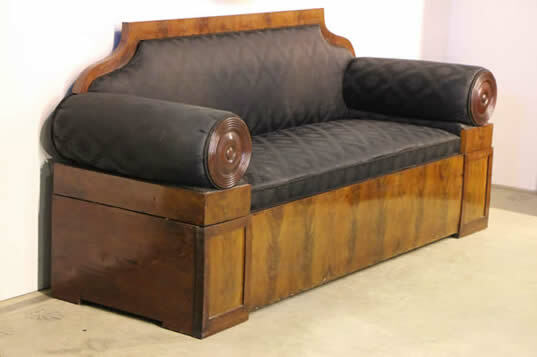 This 19th century settee is well made in teak or rosewood with traditional pegged construction, in the 18th century manner. 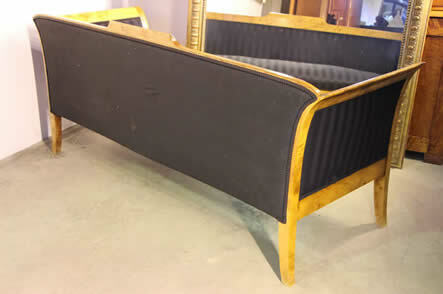 A well shaped french love seat sofa for two persons. The shaped back with curved detail joins the outward curved scroll arms. A luxurious spring upholstered seat, all fully upholstered in silken stripe fabric and complete with two matching cushions. 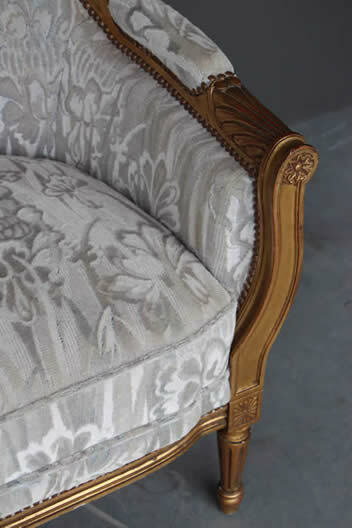 All fabric in excellent condition as it has recently been professionally reupholstered. The whole raised on carved cabriole legs. It is finished all round so it can stand in the middle of a room, or even at the end of the bed. Perfect size for the boudoir or bay window. A classic English Sheraton settee with carved shield back and finely worked marquetry scroll armrests resting on marquetry sabre legs. The Regency stripe upholstered seat with hand stitched edge and spring support for extra comfort. the gorgeous tub shape wraps and supports beautifully. In the 18th century Georgian manner but of late 19th century English revival origin. 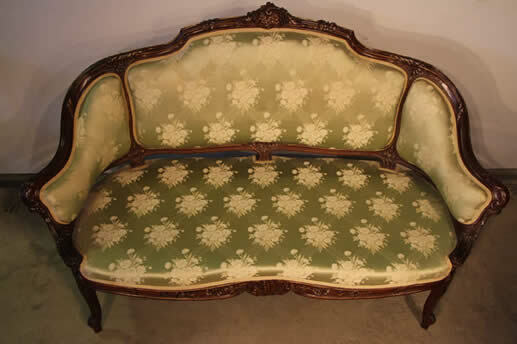 A very elegant and comfortable tub settee in the Louis XV manner. 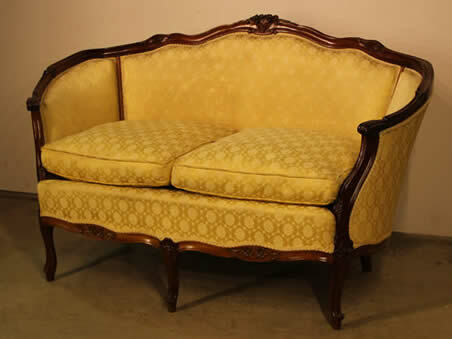 Finely carved rococo frame with yellow cotton fabric upholstered over loose down cushions resting on spring and hand stitched edge frame. Upholstered in the last 10 years, the fabric is still in good condition but may benefit from a steam clean for extra vibrancy. A lovely shape , the way the back hugs and wraps around is just superb. It is upholstered right round so can stand in the middle of a room. Matching bergere chairs are also available in the chair sellection of this website. 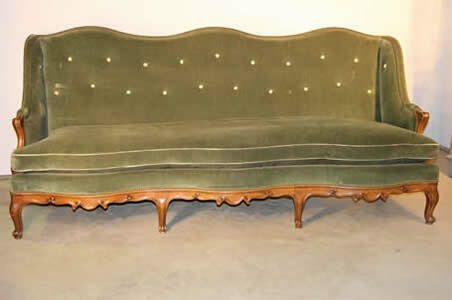 An early 20th century Biedermeier revival sofa. 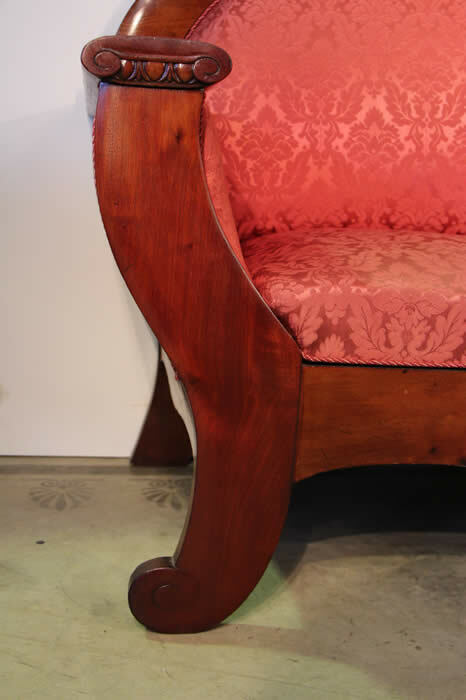 The bow shaped back hits to the Art Deco influence that the Biedermeier period had on the Deco design. The massive lyre shaped sides retain their original undisturbed patina from the early 1900's yet have a modern look to them. 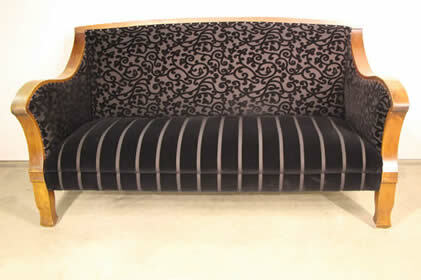 The New York style chic upholstery in luxurious black velvet , brings out the best in the shape of this settee. very comfortable sprung seat and back addes to the luxurious feel and comfort. All upholstered right round so they can stand in the middle of a room. A matching armchairs are also available separately. 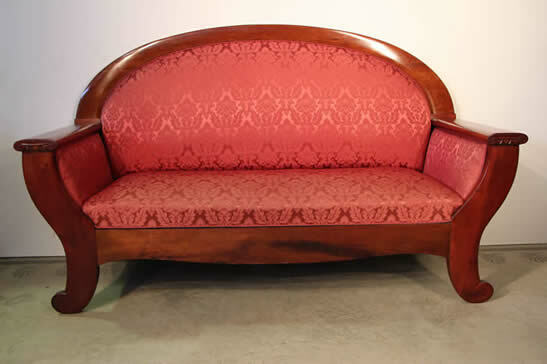 Danish Empire influence Biedermeier settee in mahogany with fruitwood inlays, ebonised finials and turned armrest supports. 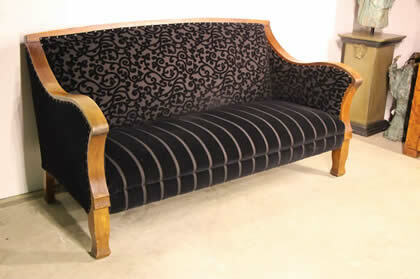 All upholstered pieces are independant and may easily be removed for easy transport. Raised on four pilaster legs, the sofa also has four dainty taper legs to front and backfor extra support to the middle of the seat, and this adds a sophisticated scandinavian lightness to the sofa design. A very comfortable two seater settee in superbly polished and very sturdy solid oak frame, ready for upholstery of your choice. The sprung seat and back with elegant carved oak curved armrests and elegant straight but rounded edge shaped feet. 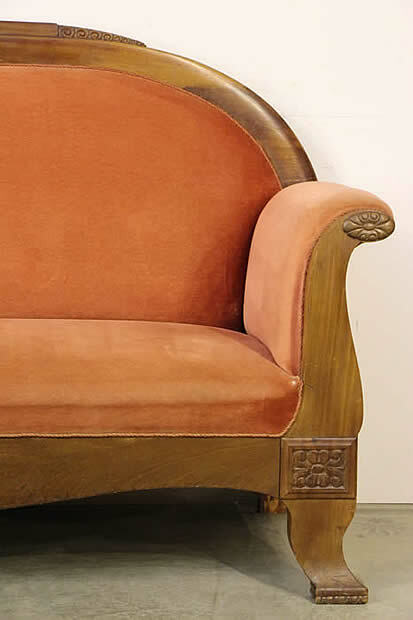 The Art Deco flow of this marvelouse sofa stems from many earlier ( 100 years earlier! ) Biedermeier period examples . 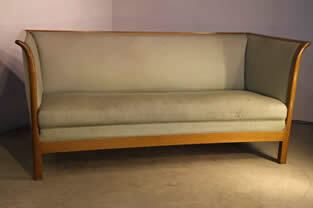 The low line back however is more 20th century in practicality as this settee could sit in the middle of a room. Ready to cover in your favourite fabric or leather. 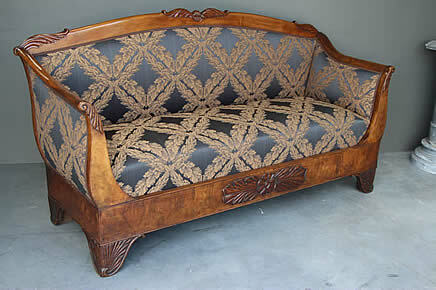 Beautiful antique carved walnut bergere shaped Louis XV style 19th century sofa. 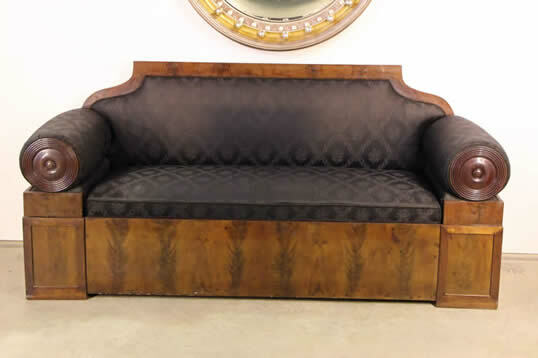 Exquisitely carved from solid French walnut this very comfortable settee still retains its original fine silk upholstery complete with luxurious down filled cushions that just hug your shape like a much lover pillow. Surprisingly the upholstery has no tears but a few minor marks see images below, or may be replaced with an updated calico. The seat cushions lift off and, as no expense was spared in this upholstery, they are silk upholstered underneath as well. 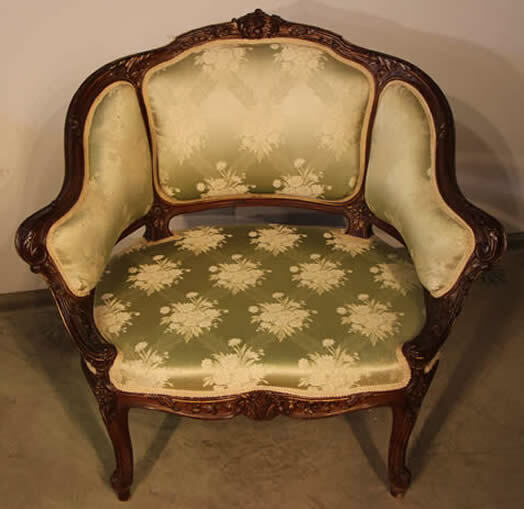 You could even do without these cushions as the seat itself is also silk upholstered, and reveals even more intricate floral Rococo carvings to the back show frame. 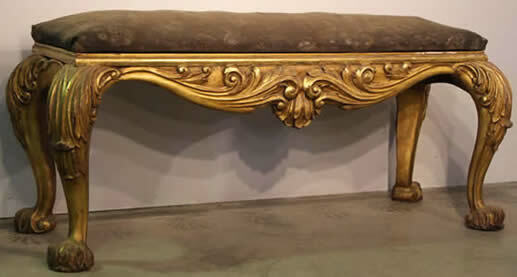 Raised on well shaped cabriole legs all the carvings show delicate highlight in gold gilt line work to further enhance the opulence of this piece. 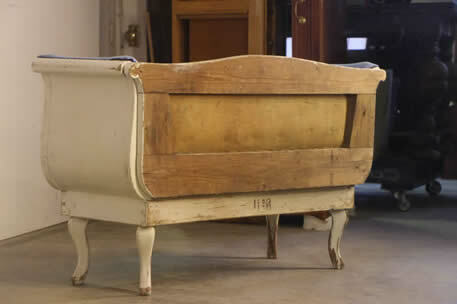 Listed separately is a matching pair of tub bergeres. Title Superbly carved pair of French Walnut bergere in the Louis XV manner. 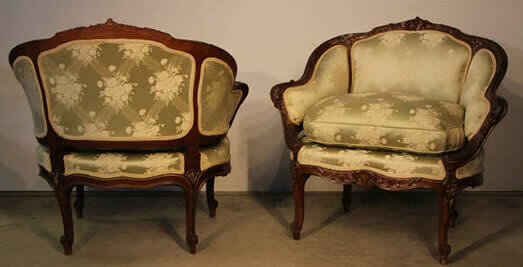 Beautiful PAIR antique carved walnut tub bergere shaped Louis XV style 19th century arm chairs. 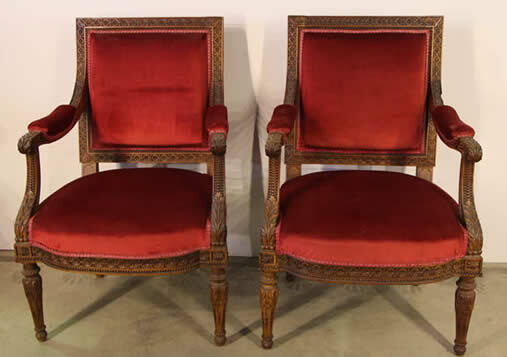 Exquisitely carved from solid French walnut this very comfortable pair of chairs still retains their original fine silk upholstery complete with luxurious down filled cushions that just hug your shape like a much lover pillow. 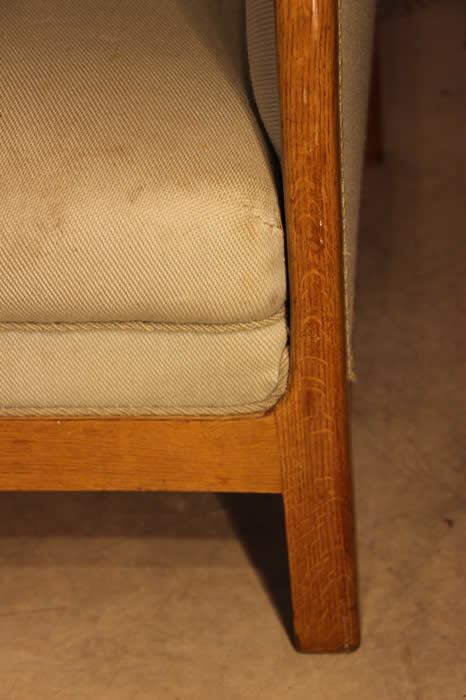 Surprisingly the original upholstery is still all there with a few minor stains and wear marks consistent with age ( see all images below) that may be cleaned away if preferred or updated with new fabric. The seat cushions lift off and, as no expense was spared in this upholstery, they are silk upholstered underneath as well. You could even do without these cushions as the seat itself is also silk upholstered, and reveals even more intricate floral Rococo carvings to the back show frame. 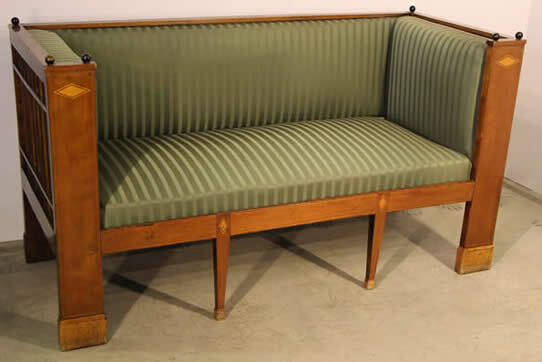 Beautiful Art Deco period settee in the manner of Carl Malmsten. 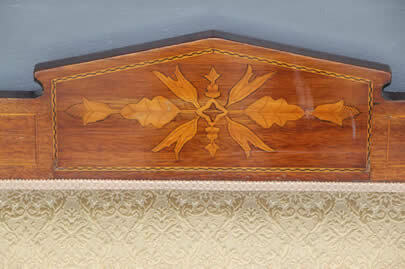 Finely inlaid show frame in rosewood, palisander and satinwood, this marquetry pattern repeats on the entire surface. the sofa is beautifully tub curved to the back for elegance and comfort. 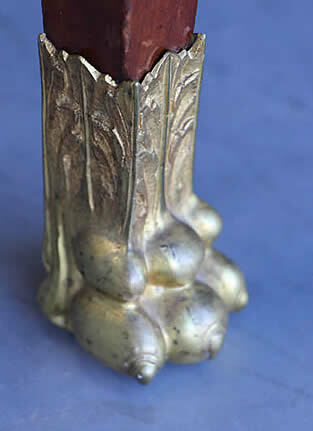 Raised on four squared legs all matched in marquetry and terminating in planished bronze feet. 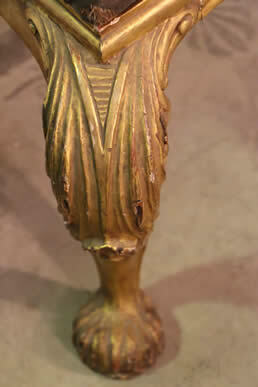 The armrests also with cast bronze button finials , all part of the Arts and Crafts influence of the period. The seat height is a standard 45 cm from floor. Circa 1920 , Swedish. Please also see the matching armchairs listed separately . 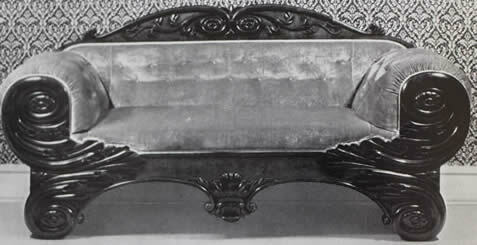 original French Empire day bed in flame mahogany and mahogany with superb ormolu capitals and bases to full turned flame mahogany columns. 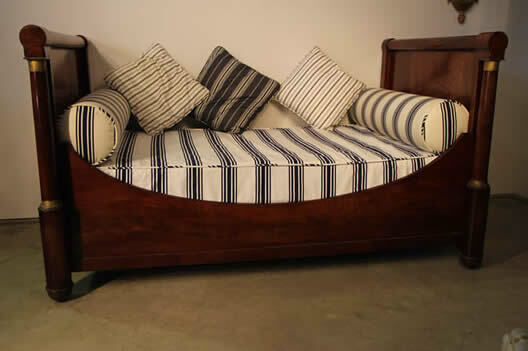 This bed is fitted with a slat base and taylor made spring matrass and has a blue and white stripe heavy cotton cover. Comes complete with bolsters and scatter cushions. 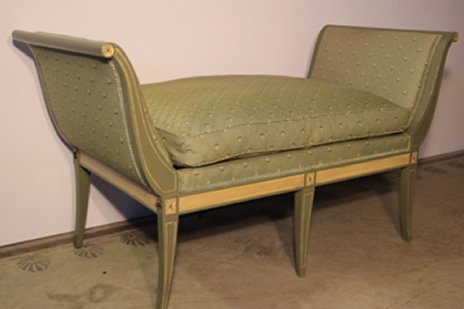 Ideal for lounging on with a good book or an intimate tete a tete. 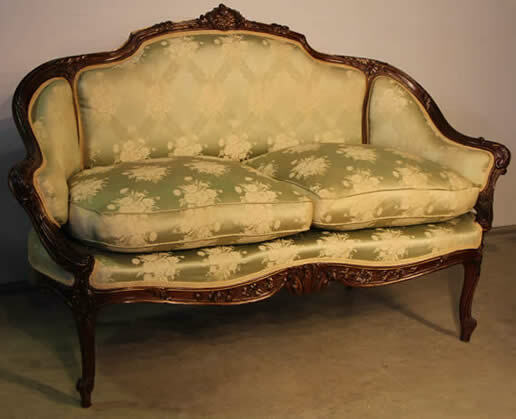 French Walnut Louis XV wingback settee. 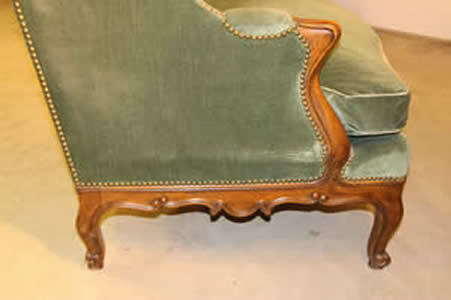 Well carved rococo polished frame and upholstered in fine sage green velvet with hand stitched edge, piping on the full down cushion and hand stitched button back. The cushion is also reversible. In excellent condition and amazingly comfortable. The back is fully upholstered with brass hobnail detail. 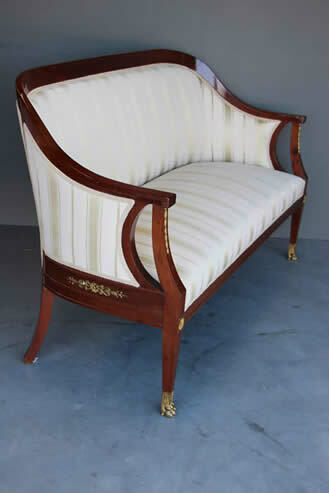 A beautifully shaped elegant Biedermeier settee of the 19th century Schinkel design. 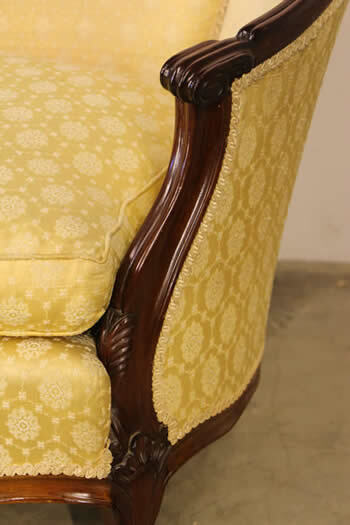 Well proportioned with ornate carved capitals to solid mahogany armrests. a superb arched back is upholstered with a taper to support the lower back and the seat is fully sprung upholstered for extra comfort. 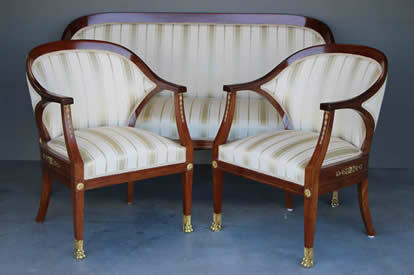 Flanked by massive flat top mahogany armrests that scroll in a neoclassical Empire design. The whole raised on elegant bas relief carved scrolling legs. Covered in superb pattern fabric and corded edging, these types of settees are very popular with the design trade , who usually use a broad stripe upholstery fabric to enhance the classical shape. Seat height is 46 cm and a luxurious depth of 52 cm for extra comfort. 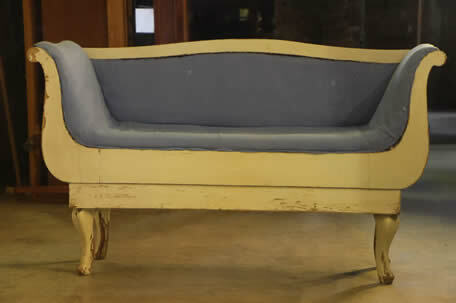 Description Beautiful French gray painted settee with white cotton squab cushion. Orgiginal paintwork and double canning. 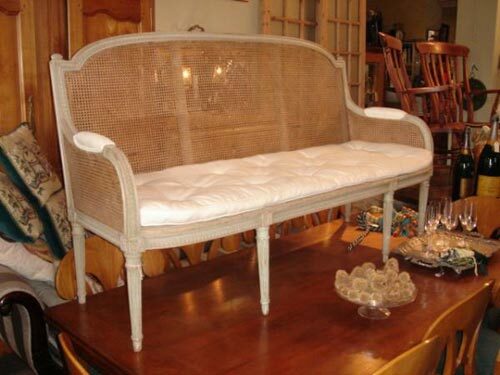 A very elegant piece itead for the lounge, sunroom or bedroom. 1840's French. 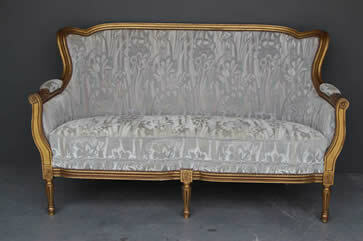 Antique early 19th century French Louis XV sofa or settee a la Reine . 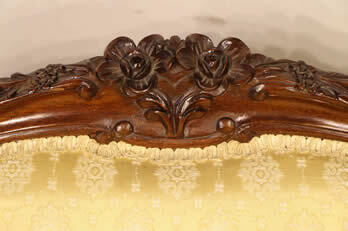 The finely carved rococo frame with gilded highlights to the floral carved details. 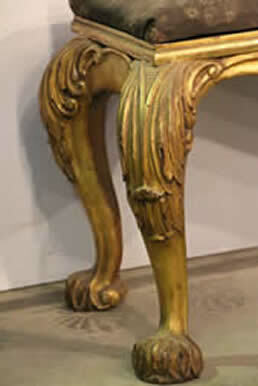 The frame raised on elegant well carved cabriole legs and with original patina and finish . 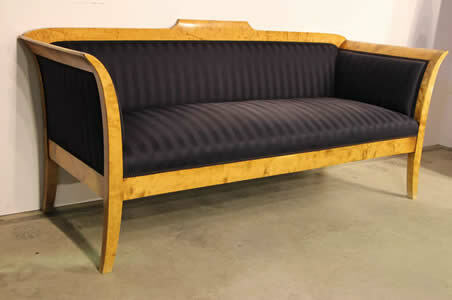 Description Rare Beautiful satin birch sofa of the karl Johan period. 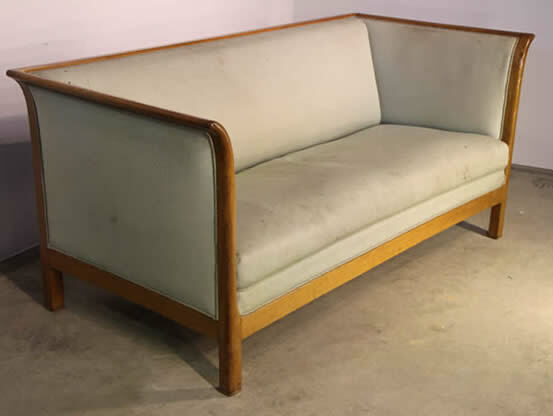 Beautiful Scandinavian Biedermeier Satin birch settee from Sweden circa 1825-30 with lovely patina and newly upholstered front seat and back as well as matching back. It is very difficult ot find such a lovely original piece in such a good condition, ohh and did we mention its also Very comfortable too! 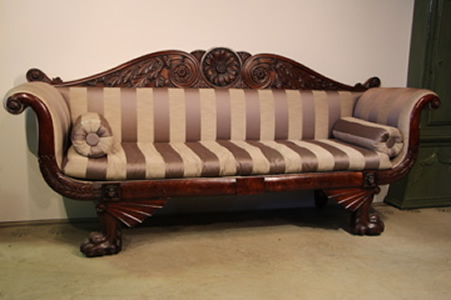 Description Very Rare American Mahogany Federal Period Settee with carved Bats wing lion paw feet supports, Acanthus scrolls and lion head cabuchons with central sunflower motif to back. Traditional full turned rear legs all this original castor supports. 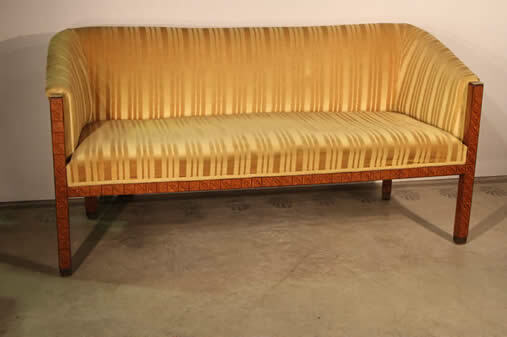 This piece has been totally reupholstered in the traditional manner with stitched edge and teased horsehair matrass. 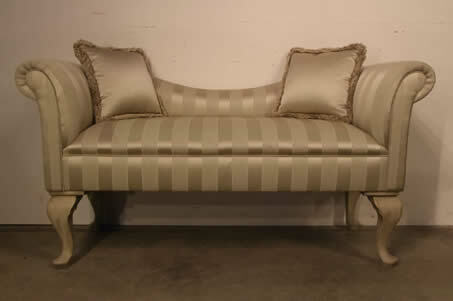 Two bolsters in Regency stripe finish the matched upholstery. It has been simpathetically uplolstered to the back so it may be used in the centre of the room, although traditionaly all sofas were meant to be placed against a wall. 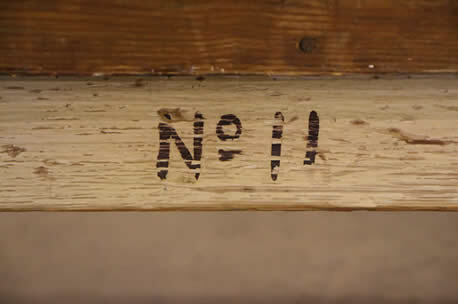 This piece has a much sought after original shellac patina and has not been refinished. It is a museum quality piece of rare Americana, in Australia.